UpFest: Women & Walls is part of Deeds Not Words , a year-long programme of events to mark 100 years since the first women were given the vote in the UK. 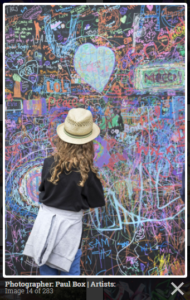 Europe’s largest, free, street art & graffiti festival, with over 350 artists painting 35 venues throughout Bedminster & Southville, Bristol from 28th-30th July. Talented artists travel from 40+ countries and across the UK to paint live on 40,000 sq ft of surfaces in front of 50,000 visitors. Upfest has commissioned three female Street Artists, Zoe Power, Caro Pepe and Nomad Clan, to mark the centenary with work exploring and celebrating the Suffrage Movement. The works will celebrate the history of suffrage, look at present day women’s lives and the future for women’s rights. Bristol Women’s Voice will have a stall outside St Francis Church over the weekend. Members of the public will have the opportunity to use BWV’s stencils of amazing women from Bristol’s history to spray their own art work, coloring sheets from The Women Who Built Bristol will be available for kids and you will be able to sign up as a member and find out more about our work. We will be selling our centenary mugs and copies of The Women Who Built Bristol, as well as some exciting new Upfest themed merchandise. More information abut the festival is available on the Upfest website.